Joel Shapiro, closely associated with the American Minimalist movement of the late 60s, took part in his first exhibition, “Anti-Illusion: Procedure Material”, at the Whitney Museum of American Art in 1969. 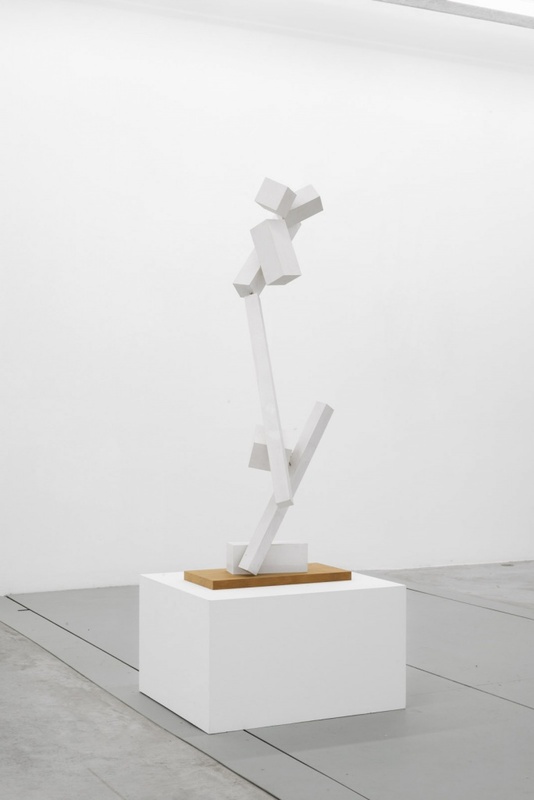 Shapiro subsequently shifted away from his Minimalist peers, toward a renewed emphasis on craft and smaller-scale sculpture. In those early years, he worked with simple imagery, making cast-iron and bronze representations of miniature bridges, chairs and houses. Then, in the late 70s, he turned to figuration to produce sculptures that physically implicated the viewer in the room. In the 80s, he created groups of stick figures. Slowly enlarged to human scale and imparted with dynamic postures, they were suggestive in their anatomies and movements, rather than descriptive. His recent work is committed to the expressive possibility of structural compositions that he suspends from ceilings, or anchors to the wall. His bright painted geometric sculptures combine simple rectangular wooden shapes that suggest bodies in motion. On the edge of representation and abstraction, Shapiro's articulated arrangements explore such issues as balance and gravity infused with a significant visual and emotional impact.